In 2007, when John Thain became the first outsider named to lead Merrill Lynch in the firm’s history, I called a bunch of former colleagues there, looking for the insider scoop on the company where I worked for 12 years. Making conversation, I said to a couple of people, “As a stockholder, I wish him well, but if the new guy doesn’t work out, at least you’d be able to say “the reign of Thain is regarded with disdain.” I should have copyrighted the phrase. Comes now the news that Thain, who briefly was a genius for selling the company to Bank of America, thereby preventing the stock from going to zero, managed to spend $1.2 million of the shareholders’ money redecorating his office. 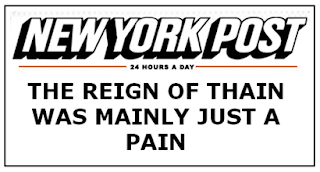 This prompted the headline above in the New York Post (if you’re reading via RSS, it says “The Reign of Thain Was Mainly Just a Pain.”) I like my version better (imagine that! ), although theirs is more true to the original rhyme scheme. Now, I don’t expect the CEO of Merrill Lynch to get his new office furniture at Ikea. But Thain was hired away from the New York Stock Exchange specifically to rescue Merrill Lynch after predecessor Stan O’Neal golfed while the subprime crisis swirled. Even on Wall Street, you’d expect he would know better than to pay a celebrity interior designer $800,000 to buy knick-knacks like an $88,000 rug. Two words, Mr. Thain: Dennis Kozlowski. It brings to mind another legendary Wall Street titan, Ace Greenberg, who used to send quirky staff memos urging employees to save money by, for example, reusing paper clips. At least he had the symbolism right. But all those paper clips were not enough to save Bear Stearns, which sold out to JPMorgan Chase in the early days of the Wall Street meltdown. This entry was posted in Uncategorized and tagged Financial Meltdown, Wall Street by Kirk Petersen. Bookmark the permalink. Most politicians and corporate CEOs live in a bubble. That’s why it is always easy for them to spend the money of someone else. Yes, but it’s not an impermeable bubble. Mr. Thain presumably noticed the hubbub over Dennis Kozlowski’s $6,000 shower curtain just six short years earlier. Would you like a Link Exchange with our blog COMMON CENTS where we blog about the issues of the day?? Check us out here…….